Legacy of the Void is the second expansion to StarCraft II and not only does it expand the original game it also completes it. With the addition of a campaign that focuses on the Protoss race, StarCraft II now delivers a full story mode for each of the three race appearing in the game. The story presented in the campaign is on the surface self-contained, but it really does provide the concluding chapter for the overall story arc that begun in the original game's Terrain campaign. As such, if you want to really understand everything that plays out in Legacy of the Void's story, then you should make your way through the Terran and Zerg campaigns first. Handing the final chapter of a "save the galaxy" story to the serious and long-winded Protoss leads to moments when the campaign almost feels like it's taking itself too seriously, but it manages to keep out of eye-rolling territory. 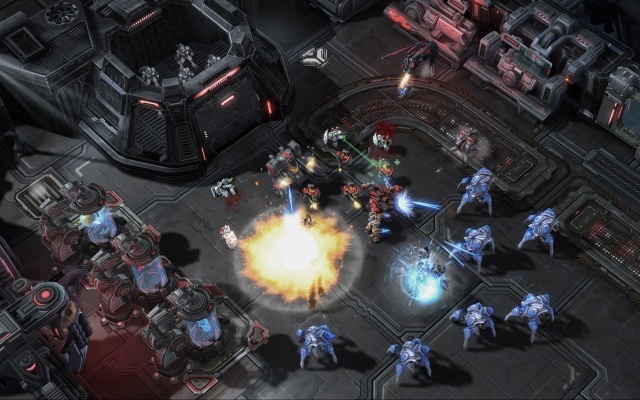 The campaign completes the StarCraft II story arc neatly, but there is certainly plenty of room left for future StarCraft stories to be told. As in StarCraft II's prior campaigns, the Legacy of the Void campaign is not just a series of linear missions punctuated with occasional cutscenes. When not in a mission you'll spend your time on the Protoss Arkship, The Spear of Adun, which serves not only as the campaign hub, but also a weapon of war that you can call on during the campaign. You can customize its loadout to give it more of an offensive or support role in the missions, making choices between capabilities like orbital strikes and the ability to instantly deploy pylons where you need them. While on the ship you can also select which special units will be available to you in your missions, with your choices here being driven by whether you'd prefer to go with the stealthier Dark Templar units or not. Some of these various upgrades will need to be earned first, though, by playing through side missions or completing optional objectives in others. And for those who want the full story, you can find most of the story's major players in different areas of the ship and engage them in conversations. There's a good variety to the missions - you don't have to face an endless stream of "build your base and then destroy their base" missions. I found the challenge level to be higher here than in the previous StarCraft II campaigns, especially if you want to meet all of the optional objectives and collect the achievements for the missions. There were a couple of missions in which things started to fall apart for me more than twenty minutes into the battle and had me starting them over again and completely changing my approach. Some missions still stand out in my mind as epic battles that both took a while to complete and left me with a feeling of accomplishment once I slogged my way to victory at the end. There are some new gameplay options outside of the campaign that come with Legacy of the Void. The first is a hero-focused co-op mode where you choose from one of six available heroes that will change the character and make-up of your army and that each provide a unique set of bonuses. It made me think of Command & Conquer Generals if you can remember that game. The focus in this mode feels more like it is on leveling the hero that you choose to specialize on than it is on the missions themselves since they all have pretty straightforward objectives. This mode comes with full matchmaking support, so you can jump in and play some co-op even when your friends are offline. Archon Mode is a competitive co-op mode in which each side in the fight is under the control of two players. Touted as a training mode in which a veteran player can bring a newbie up to speed on competitive multiplayer play, it's also an opportunity to add some variety to your multiplayer play by working some team-based competition into your game sessions. Yes, it can be a comedy of miscommunication, and, yes, it can be a testament to the power of teamwork. Players who establish clear responsibilities and can communicate effectively will find the latter case to be their experience with this mode. In any case it's certainly a change of pace from the traditional mode and I believe that some gamers will love this mode while others may loathe it. The biggest change to the multiplayer game is the addition of six new unit types, two for each of the three factions. Terran forces get the Cyclone, a wheeled drone that can target both air and ground units and that can keep a lock-on on its targets as they are moving, and the Liberator, a dual mode air unit. When in flight it is anti-air, but it can deploy an anti-ground cannon and become a stationary floating platform that can attack ground units. The Zerg get the Ravager, a large, lumbering artillery unit with a big punch, big enough to destroy Protoss force fields. The other unit is more the return of an old favorite than an entirely new unit type - the Lurker. Lurkers can only attack while burrowed, but they are pretty deadly in that state, sending out a spine attack that travels forward from their positions and damages anything on the ground in its path. Protoss add the Adept, a ranged ground unit with a teleportation ability and armed with a weapon that sends out a mini shockwave if it strikes a killing blow. Lastly, we have the Disruptor, a floating energy ball that attacks by unleashing an energy burst that's deadly against dense groups of enemies. None of the units unbalance or disrupt the gameplay, instead making additional tactical options available to players and forcing them to make adjustments to counter the new attack capabilities of their enemies. Overall, I can easily recommend Legacy of the Void to any current StarCraft II player, and if you're new to StarCraft II then now is the perfect time to jump in and experience the full story arc. Blizzard has once again managed to add to an already great existing game, making it better and more complete without breaking anything that made the game great in the first place. Final Rating: 94% - StarCraft II continues to build its legacy.